The Carroccio of Legnano, a history painting by Amos Cassioli (1832–1891). 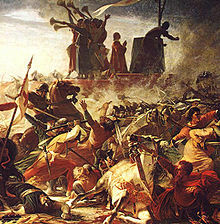 A Carroccio (Italian: [karˈrɔttʃo]; Lombard: carrocc) was a four-wheeled war altar, mounting a large vexillum standard, drawn by oxen, used by the medieval republics of Italy. It was a rectangular platform on which the standard of the city and an altar were erected; priests celebrated Mass at the altar before the battle, and the trumpeters beside them encouraged the fighters to the fray. In battle the Carroccio was surrounded by the bravest warriors in the army as the carroccio guard, and it served both as a rallying-point and as the palladium of the city's honour; its capture by the enemy was regarded as an irretrievable defeat and humiliation. It was first employed by the Milanese in 1038, and played a great part in the wars of the Lombard League against the emperor Frederick Barbarossa. One account states that it first appeared in Milan in 1039, when archbishop Heribert urged the Milanese to construct one. It was afterwards adopted by other cities, and first appears on a Florentine battlefield in 1228. The Florentine Carroccio was usually followed by a smaller cart bearing the Martinella, a bell to ring out military signals. When war was regarded as likely the Martinella was attached to the door of the Church of Santa Maria in the Mercato Nuovo in Florence and rung to warn both citizens and enemies. In times of peace the Carroccio was in the keeping of a great family which had distinguished itself by signal services to the republic. The Florentine carroccio was captured by the Ghibelline forces of Castruccio Castracani in the 1325 Battle of Altopascio, after which it was displayed by the victors in a triumph held in the streets of Lucca. The carro della guerra of Milan was described in detail in 1288 by Bonvesin de la Riva in his book on the "Marvels of Milan". Wrapped in scarlet cloth and drawn by three yoke of oxen that were caparisoned in white with the red cross of Saint George, the city's patron, it carried a crucifix so massive it took four men to step it in place, like a ship's mast. Accounts of the Carroccio will be found in most histories of the Italian republics. A full-length book treatment of the subject, with discussion of the symbolic significance of the war-cart for contemporaries and later ages, is given by E. Voltmer. Similar cart-mounted standards were also to be found elsewhere in Europe, at the Battle of the Standard, employed by the English, and at the Battle of Sirmium, employed by the Hungarians. Wikimedia Commons has media related to Carroccio. ^ Mallett, Michael (2006). Signori e mercenari - La guerra nell'Italia del Rinascimento [Mercenaries and their masters] (in Italian). Bologna: Il Mulino. p. 21. ISBN 88-15-11407-6. ^ Santosuosso, Antonio (2004). Barbarians, Marauders, and Infidels: The Ways of Medieval Warfare. New York, NY: MJF Books. p. 192. ISBN 978-1-56731-891-3. ^ Bovesin de la Riva, De Magnalibus Mediolani: Meraviglie di Milano (Milan, 1998), as reported in John Dickie, Delizia! The Epic History of Italians and Their Food (New York, 2008), p. 33. ^ Treadgold, Warren (1997). A History of the Byzantine State and Society. p. 646. Stanford University Press. ISBN 0-8047-2630-2. This article incorporates text from a publication now in the public domain: Chisholm, Hugh, ed. (1911). "Carroccio" . Encyclopædia Britannica. 5 (11th ed.). Cambridge University Press. p. 408d.